Edward Lovibond was born in Hampton, the son of a director of the East India Company. He entered Magdalen College, Oxford in 1739, contributed poems and articles to a journal called The World (to which Richard Owen Cambridge contributed) and addressed other poems to his friends. His poems were collected together by his brother and published by him in 1785. In 1744 he married Catherine Hamilton, daughter of Gustavus Hamilton (son of Gustavus Hamilton 1st Viscount Boyne), and Dorothea Bellew. Reputedly the marriage was unhappy. From 1754 he lived in Elm Lodge, formerly the residence of Charles Jervas the court painter. 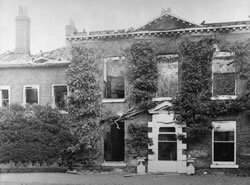 Elm Lodge, otherwise known as The Elms, was in the High Street, Hampton and was burnt down by Suffragettes in 1913. He died in 1775, leaving the property in trust shared between his brother Anthony, Lancelot (Capability) Brown and Thomas Nobbs (sometimes Nobbes). At this time Brown and Nobbs were living at Hampton Court - Lancelot Brown at "Wilderness House" and Nobbs at what became the "Old Court House". In 1776 the trustees disposed of the copyhold of Elm Lodge to Thomas King. Footnote: Thomas Nobbs, a friend of Brown, is recorded as living at Crossdeep Lodge, Cross Deep, Twickenham between 1757 and 1771, when he bought the lease of Old Court House, Hampton. Nobbs, a bachelor, shared the house with his sister, Mrs Martha Mann. He had been the legatee and executor of the estate of Thomas Quin, the actor whose portrait by Gainsborough he possessed. He died in 1785 and was buried in Hampton Church. contributed poems and articles to a journal called "The World"